Per the World Health Organization (WHO), some natural heavy metals can enhance the quality of life, health, and wellbeing. Metals such as iron, copper, magnesium, zinc, chromium and manganese are essential for health in minuscule amounts. For example, iron is needed for blood production, oxygen transport, energy metabolism, proper immune function, and collagen and neurotransmitter synthesis; zinc aids hormone regulation and gene activity; magnesium is necessary for muscle function, strong bones and healthy teeth; copper plays a role in iron metabolism, melanin synthesis, and central nervous system function; selenium is a component of glutathione peroxidase, which protects protein, cell membranes, lipids and nucleic acids; and manganese aids energy production by breaking down fats, carbohydrates and protein. While some elements are necessary in minute amounts for human health, others are toxic or carcinogenic, affecting the liver, kidneys and the central nervous system. Heavy metals are defined as any metallic chemical element that has a relatively high density and is toxic or poisonous at low concentrations. These include cadmium, mercury, lead, and arsenic, which along with air pollution, dioxins and hazardous pesticides, appear on the WHO’s list of ten chemicals of major public health concern. Highly toxic, arsenic is widely distributed throughout the environment as a naturally occurring substance, or as a result of contamination from human activity, including mining and smelting ores, the burning of fossil fuels, and previous or current use of arsenic containing pesticides. Arsenic is found in rocks, soil, air, groundwater, and foods such as rice, grains, fruits, fruit juices and vegetables. Because arsenic is found in soil and water, it is absorbed by plants whether grown conventionally or organically. Long term exposure to high levels of arsenic can lead to chronic arsenic poisoning associated with higher rates of skin, bladder and lung cancers, as well as diabetes and pulmonary and cardiovascular disease. Per WHO, inorganic arsenic is a confirmed human carcinogen and is the most significant chemical contaminant in drinking water globally. Arsenic is found in high levels in groundwater in countries such as China, India, Mexico and the United States. Fertilizers produced from phosphate ores are a major source of diffuse cadmium pollution. Food is the main source of cadmium intake for non-occupationally exposed people. Because insecticides, fungicides and commercial fertilizers contain cadmium that pollutes the soil, cadmium was found to be significantly higher in non-organic food crops. Crops grown in polluted soil or irrigated with polluted water, as well as meat from animals grazing on contaminated pastures, may contain increased concentrations. Studies have shown that cadmium exposure can result in high blood pressure, osteoporosis, and kidney, liver, brain, lung, and immune dysfunction. As a neurotoxic chemical, even a small amount of mercury exposure may cause serious health problems, including heart disease and changes to the brain. Mercury exposure can have toxic effects on the nervous, immune and digestive systems, as well as deleterious effects on the lungs, kidneys, skin, and eyes. While mercury occurs naturally in the earth’s crust, it is released into the environment largely as a result of human activity. While some mercury is released through volcanic activity, the majority of mercury is released into the environment through coal fired power stations, residential coal burning, industrial processes, waste incineration, and precious metal mining. Toxic to the central and peripheral nervous systems, mercury is found in dental amalgam fillings, and every day products such as batteries, light bulbs, cosmetics and pharmaceuticals. Lead has a cumulative neurotoxic effect on multiple body systems, including the brain, liver, kidneys and skeletal system. Particularly toxic to women of child bearing age, fetuses and young children, there is no known amount of lead exposure that is considered safe. As a naturally occurring toxic metal, the widespread use of lead in gasoline, pigments, vehicle batteries, toys, cosmetics, plumbing pipes, electrical wiring, and jewelry, as well as mining, smelting, and manufacturing, has resulted in extensive environmental contamination. Lead exposure can result in a wide range of biological effects dependent upon the level and length of exposure. High levels of exposure may result in toxic effects that may cause problems in the gastrointestinal tract and joints, as well as hemoglobin synthesis and acute or chronic damage to the nervous system. Per the National Institutes of Health (NIH), heavy metal soil pollution is a serious global environmental problem that adversely affects plant growth and alters the composition and activity of soil microbial communities. 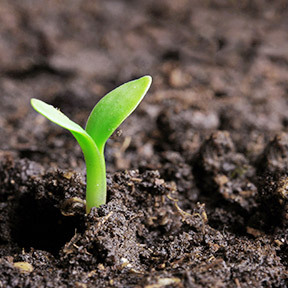 Soil is essential for seed germination, and for the growth and survival of plants. Seeds are stressed by the presence of heavy metals, which, decrease germination, reduce root elongation and negatively affect protein levels. In plants, soil pollution results in oxidative damage, and altered sugar and protein metabolism, resulting in cellular damage and nutrient loss. In response to heavy metal exposure, plants have developed detoxification mechanisms. Heavy metal chelators, known as phytochelatins are synthesized from reduced glutathione, which helps plants to ameliorate the toxic effect of heavy metals. In addition to posing serious threat to agricultural produce, the toxic accumulation of certain heavy metals in the body may compete with and replace essential minerals, which can lead to harmful health consequences to the body’s organ systems. Heavy metals can accumulate in the soft tissues of the body in concentrations sufficient to cause physiological, neurological and behavioral changes. Long term exposure may result in symptoms of muscle and joint pain, chronic fatigue, digestive and immune issues, neurological conditions, infertility and heart disease. Although the liver, kidneys and gastrointestinal system are designed to remove toxins, the body can become overwhelmed by pollution, pesticides and other harmful chemicals. Glutathione, found in all bodily cells, is a powerful antioxidant and a natural detoxifying agent. Aging, stress, poor diet, injury, and illness all contribute to low cellular levels of glutathione. However, you can help to protect the body from oxidation by supporting the production of glutathione, as glutathione is both produced and recycled within the body. Increasing the blood levels of glutathione supports immune function, reduces free radicals, optimizes detoxification, and enhances heavy metal clearance. Detoxification, as well as glutathione synthesis and recycling can be enhanced by a sulfur-rich diet, exercise, and proper supplementation. – Glutathione on its own is not readily bioavailable. Liposomal glutathione, however, is believed to be fully absorbable. For optimal absorption and bioavailability, s-acetyl-glutathione provides the acetylated form of glutathione. -One of the most effective ways to improve and ensure healthy levels of glutathione is by supplementing with N-Acetyl Cysteine (NAC), an essential amino acid and a main building block of glutathione. Those taking medications should consult their healthcare provider before supplementing with NAC. – Be sure to get adequate levels of vitamins B6, B12, folate and betaine to support critical bodily functions, that include DNA repair, detoxification and immune health. – Consider supplementing with liver-supportive milk thistle, as well as selenium, which supports glutathione recycling, and alpha lipoic acid for support of many bodily processes, including detoxification and energy production. -Bioactive, pesticide and hormone free whey protein is a great source of cysteine and other amino acids that support glutathione synthesis. – Be sure to include sulfur-rich, cancer-fighting cruciferous vegetables in your diet. Studies have shown that sulfur amino acids stimulate glutathione production and support higher glutathione levels. -Studies suggest that moderate exercise, especially cardiovascular exercise in combination with weight training, can increase glutathione levels, which helps to boost immunity, support detoxification and enhance antioxidant defenses. NAC 600 mg by Pure Encapsulations®: This free form amino acid provides nutritional and antioxidant support, promotes healthy glutathione levels, and supports heavy metal detoxification by helping to reduce cadmium and mercury accumulation in the kidneys and liver. Gluten free, Non-GMO vegetarian formulation. Liposomal Glutathione by NuMedica: This product provides 500 mg of liposomal glutathione and activated B vitamin cofactors for optimal absorption and bioavailability in support of the immune and detoxification systems. Gluten free, Non-GMO vegetarian formulation. S-Acetyl Glutathione Synergy by Designs for Health®: This product provides 1 g of NAC and 200 mg of the acetylated form of glutathione for optimal absorption and bioavailability. Gluten free. Metal-X-Synergy™ by Designs for Health®: This complex includes ingredients that work synergistically to bind to heavy metals without depleting essential minerals. This formula includes NAC, reduced glutathione and alpha lipoic acid in support of heavy metal detoxification. Gluten free, Non-GMO formulation. Mercury Detox™ by Integrative Therapeutics®: This blend of powerful ingredients includes selenium, NAC, reduced glutathione and amino acids for targeted support for heavy metal detoxification. Gluten, wheat, soy, dairy, preservative and artificial ingredient free formulation. AntiOxidant Formula by Pure Encapsulations®: This synergistic broad-spectrum formula provides antioxidant nutrients to promote cellular heath and support the body’s natural defense mechanisms. Ingredients include milk thistle, NAC, and selenium. Gluten and soy free, Non-GMO hypoallergenic formulation. Whey Protein Concentrate by Biotics® Research: This whey protein concentrate is derived from the milk of grass fed New Zealand cows in support of detoxification, glucose metabolism and liver and gallbladder health. Gluten free. Folate 5,000 Plus by Pure Encapsulations®: Folate Plus provides the universally metabolized and biologically active form of folate as 5-MTHF as well as optimal levels of vitamin B6 and B12 in support of cellular, cardiovascular, neurological and psychological health. Non-GMO vegan formulation.